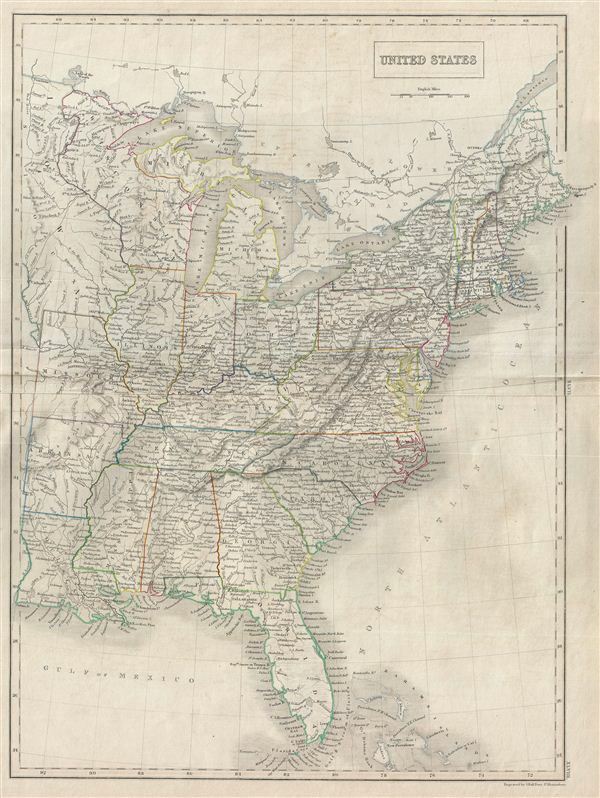 A fine example of Adam and Charles Black's 1840 map of the United States. Covers the populous eastern portions of the United States from Lake Superior in the north to the Bahamas in the south and from Missouri in the west to Maine in the east. The United States at this time was witnessing a period of rapid expansion as well as rising anxiety over the issue of slavery. These tensions would grow over the next twenty years culminating in the American Civil War. This map was engraved by S. Hall for issue in the 1840 edition of Black's General Atlas. Very good. Blank on verso. Original platemark visible. Original centerfold. Rumsey 2305.055 (1854 edition). Philips (atlases) 4334.